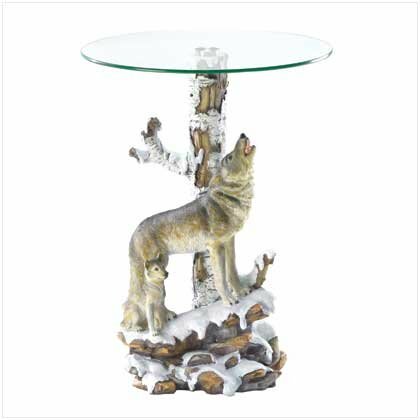 Beside the birch-trunk base of this glass-topped table, a mother wolf calls out her homage to the moon as her cub looks on. A breathtakingly beautiful glimpse into the world of the wild frontier, captured here forever in this amazing work of art. Marvelously detailed and carefully crafted to amaze and delight! Polyresin base with glass tabletop. 18 7/8 inches diameter x 24 1/4 inches high.